Once again, I have been OBE (overcome by events) and not had much to write about. I think winter may be over here in Houston, darnit. But earlier this evening, I was prowling on Amazon, Half.com and eBay looking for something (never found it.) I also was on Suzanne Somers’ website, because I need to get more Somersweet. I glanced at her section on Cooks Tools, and when I looked at the hand mixer and ice shaver, two words came to mind. And, yes, I used them, along with the iron, when I started sewing. It was the early 70’s. We hadn’t yet been told to take off those aprons (and get splattered with tomato sauce) and be free from our domesticity. OK, I’ve benefitted in some ways from said “liberation,” as we all have. But bear with me on this one. Eventually it happened, and women began to shun the finer points of homemaking. Toys of this sort fell out of favor, although were still produced in different forms. Light bulb technology. Worked like a charm. Just make sure you watch it, because there was no timer on these. Remember, domesticity, we were told, was bad for us girls. REALLY? Guess what? 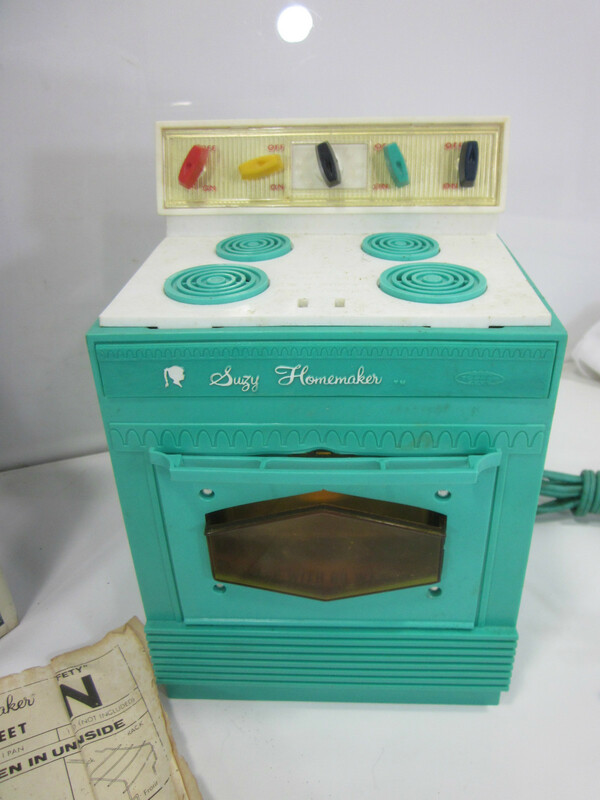 The Easy-Bake Oven is still made by Hasbro, and marketed as the Easy Bake Oven For Girls. That’s what it says on the home page. You can also buy the mixes and accessories on their site as well as Amazon.com. Oh, the things I could have whipped up with this bad boy! I was the oldest of four, with two bruiser brothers and a fussy baby sister–I could have cooked for all four of us! But no, I had to stick with what I had. Still, I did OK. Kept me out of Mom’s hair for a while. And, eventually, I started cooking on the regular stove in the kitchen, much to Mom’s chagrin. 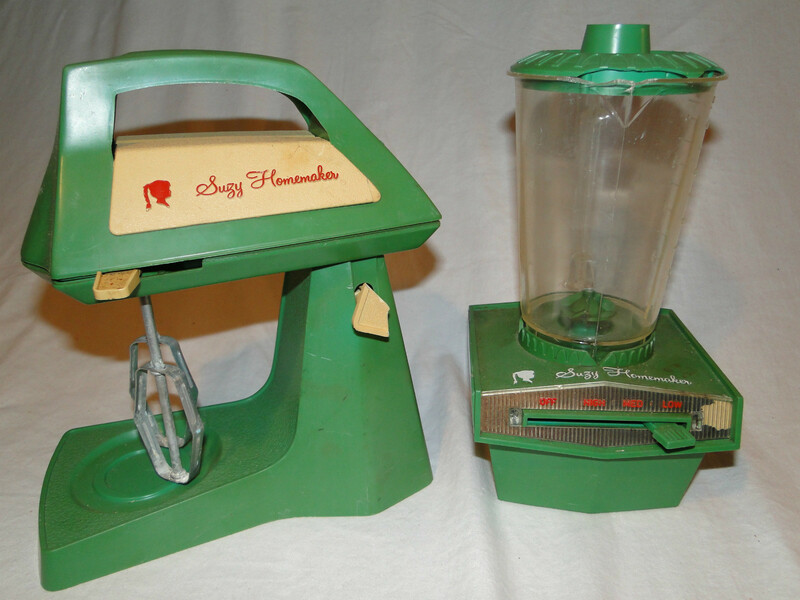 I dreamed of one day having the entire collection of Suzy Homemaker appliances. A fully functional kitchen. In my room. Basically, I wanted my own apartment. These images are from current sales on eBay. If you look on some of the listings, you’ll see how much these now-antique items are going for–YEOW. A lot more than they sold for new. Many of them also work–but it won’t replace your KitchenAid stand mixer, OK? Are you starting to get where I’m going with this? Keep reading. . . . The term “Suzy Homemaker” eventually became a feminist insult to be thrown at women who did the domestic/child raising thing, but women still did it despite all that. So how did all those “Suzy Homemaker” generation women and girls turn out? Take a look at the great mixing bowl you can get from the Martha Stewart Collection at Macy’s. That color is, reportedly, Martha’s favorite, and figures into quite a lot of her collection (as well as packaging and labels) at Macy’s, Kmart, Staples, Michael’s and other stores that carry the Martha name. Heck, it even backs up her website. 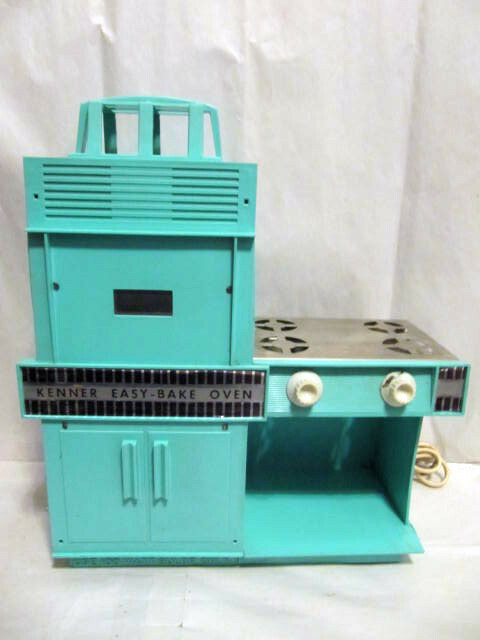 It’s the same color as the Easy-Bake Oven and the Suzy Homemaker stove. Are you still wondering? Today we not only have the Food Network, and it’s digital cable child, Cooking Channel, we have a million websites devoted, in one way or another, to cooking. In addition to very modern home diva Martha Stewart, there is the gorgeous Nigella Lawson, whose book How to be a Domestic Goddess was a best seller, as were others–with good food in them. There’s the movie-star-lookalike Giada de Laurentiis, who also writes cookbooks with easy Italian food. The Barefoot Contessa, Ina Garten, whose cookbooks have tried-and-true recipes that really are foolproof. There are many others, like Ree Drummond, The Pioneer Woman, Rachael Ray, Tyler Florence, as well as others you may not have heard of, like Rose Levy Berenbaum and Barbara Kafka. And then there’s me, who cooks out of every one of them and loves to eat, as well as write about all this stuff. Sure, men cook too, and very well–but after all that fuss about cutting the apron strings, we’ve come around again. Fifty years after Betty Friedan’s The Feminine Mystique was published, launching the second wave of feminism, more women love to hang out in the kitchen again, want the best appliances and cooking tools, buy cookbooks and use them (as well as apps for recipes and videos for technique) and enjoy cooking delicious and healthy meals for their families, as well as have fabulous meals for holidays. I really can cook, despite what my brother says. Honest. We’re more sophisticated now–we buy sugar snap peas, free-range chickens and eggs, grass-fed beef, almond milk, agave syrup, and other things our mothers and grandmothers didn’t have. Stores like Target, Wal-Mart, Bed, Bath and Beyond (never mind the myriad of websites) are filled to the rafters with not only sophisticated cooking tools, but endless amounts of home decor for discriminating decorators. I myself own five French press coffee pots of varying sizes. Long story. Homemaking is still an art, however you enjoy it, whether you’re a man or a woman, wherever you live. And hey–men join them in the kitchen to cook, help out or do the washing up. They have their own decorating styles, from the minimalist to the sophisticated “man-cave.” There is now equality in the kitchen, with like-minded spouses. We are again getting suited up, booted up, and into that kitchen to cook–with aprons, people! There are also a number of blogs called “Suzy Homemaker,” too. Take your pick. For your entertainment, I found an original Suzy Homemaker video on YouTube. Check it out for some antique marketing. Here’s another, and another. (I really wanted that ice maker thing, too, so I could make snowballs at home for the fam.) Here is a longer one introducing new colors. . .circa 1971. OMG–I was just a little bitty kitty! Suzy Homemaker is still around. She never really left. She’s just been waiting to make a comeback. And, she has, finally.